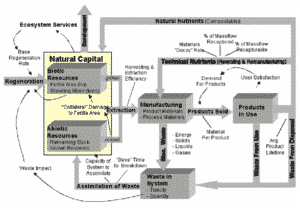 Natural capitalism is a system of four interlinking principles, where business and environmental interests overlap, and in which businesses can better satisfy their customers' needs, increase profits and help solve environmental problems all at the same time. It is an economic system that incentivizes profit based on proper care of the environment and assigns an economic value to stewardship of the planet. For example, income from natural capital includes yield from trees and plants in their natural state, not just from their extraction state. In the book, "Natural Capitalism: Creating the Next Industrial Revolution", the authors describe the global economy as being dependent on natural resources and ecosystem services that nature provides. Natural Capitalism is a critique of traditional "Industrial Capitalism", saying that the traditional system of capitalism "does not fully conform to its own accounting principles. It liquidates its capital and calls it income. It neglects to assign any value to the largest stocks of capital it employs – the natural resources and living systems, as well as the social and cultural systems that are the basis of human capital." The authors explain, "Natural capital refers to the earth’s natural resources and the ecological systems that provide vital life-support services to society and all living things. These services are of immense economic value; some are literally priceless, since they have no known substitutes. Yet current business practices typically fail to take into account the value of these assets—which is rising with their scarcity. As a result, natural capital is being degraded and liquidated by the very wasteful use of resources such as energy, materials, water, fiber, and topsoil. The next industrial revolution, like the previous ones, will be a response to changing patterns of scarcity. It will create upheaval, but more importantly, it will create opportunities. Through fundamental changes in both production design and technology, farsighted companies are developing ways to make natural resources — energy, minerals, water, forests — stretch five, ten, even 100 times further than they do today. The resulting savings in operational costs, capital investment, and time can help natural capitalists implement the other three principles. Natural capitalism seeks not merely to reduce waste but to eliminate the very concept of waste. In closed-loop production systems, modeled on nature's designs, every output either is returned harmlessly to the ecosystem as a nutrient, like compost, or becomes an input for another manufacturing process. Industrial processes that emulate the benign chemistry of nature reduce dependence on nonrenewable inputs, make possible often phenomenally more efficient production, and can result in elegantly simple products that rival anything man-made. The business model of traditional manufacturing rests on the sale of goods. In the new model, value is instead delivered as a continuous flow of services—such as providing illumination rather than selling light bulbs. This aligns the interests of providers and customers in ways that reward them for resource productivity. Capital begets more capital; a company that depletes its own capital is eroding the basis of its future prosperity. Pressures on business to restore, sustain, and expand natural capital are mounting as human needs expand, the costs of deteriorating ecosystems rise, and the environmental awareness of consumers increases. Fortunately, these pressures all create business opportunity.